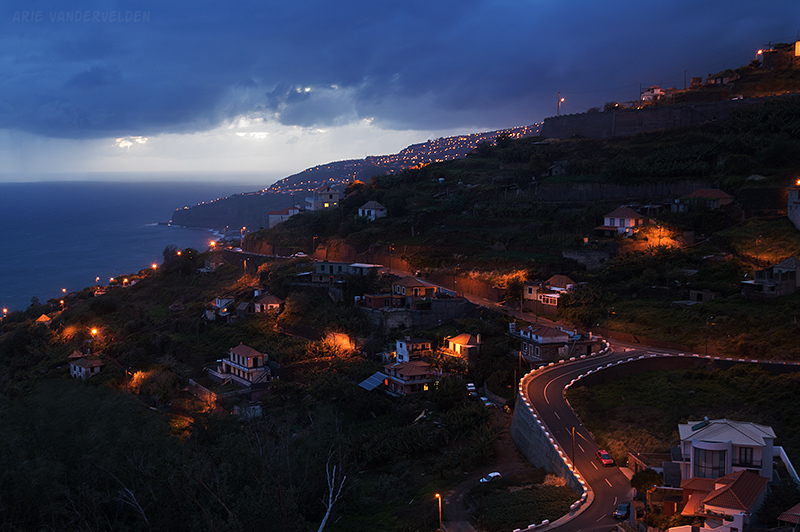 Madeira is a volcanic island in the middle of the Atlantic Ocean. It’s at about the same latitude as Casablanca Morocco, Bermuda, and Charleston South Carolina. It is administered by Portugal, and has a temperate to sub-tropical climate. Pretty much anything grows here. 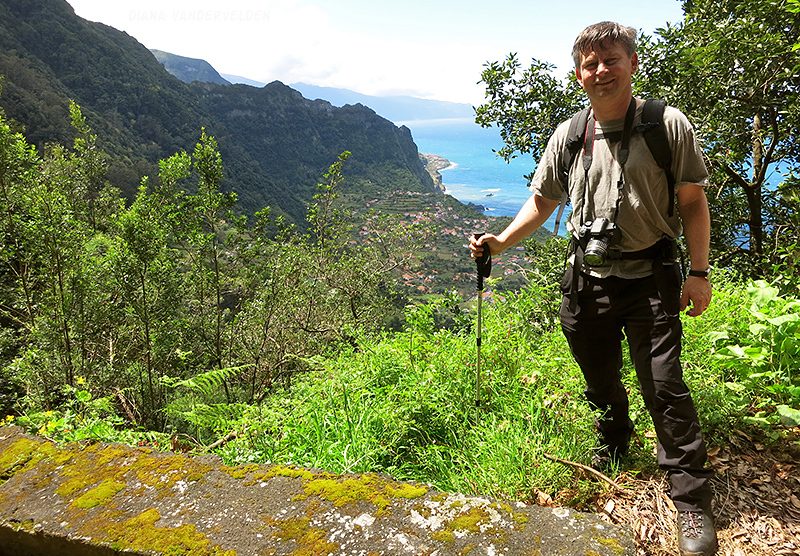 Madeira is a very rugged island with coastal cliffs all around. Landing at Cristiano Ronaldo airport is an exciting affair. We approached from the north and flew past the runway. We could clearly see it out of the right window. The pilot banked hard to the right, pointing the plane straight at the mountain above the capital city Funchal. I had my eyes wide open at this point. With not much more room to go, we banked hard to the right again, another tight 90-degree turn, to line up with the end of the runway. All passengers breathed a collective sigh of relief when the wheels touched the tarmac. I did not know a Boeing 737-800 had such a tight turning radius. Apparently, pilots must undergo special training to land at this airport. 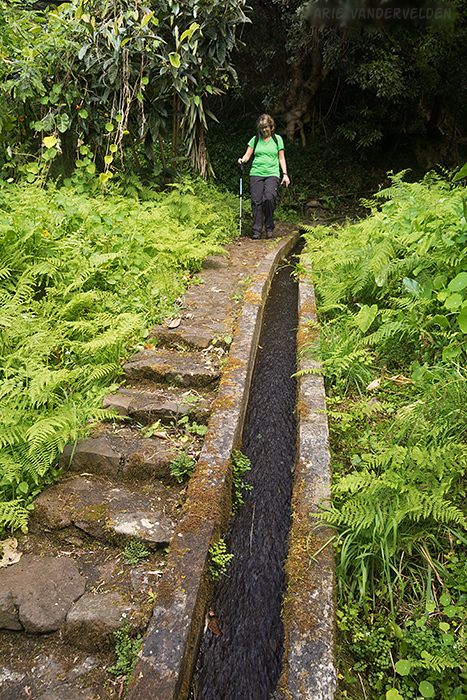 Madeira is known for its irrigation channels called levadas. 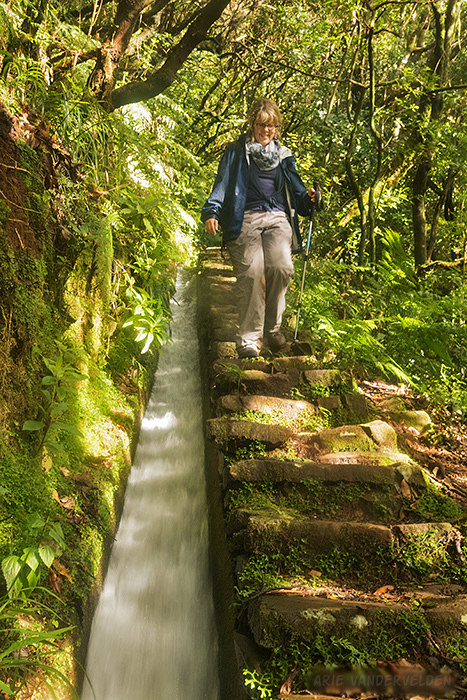 The levadas contour around steep mountainsides, taking water from streams in the rainy interior and delivering it to drier areas. They are a civil engineering marvel. 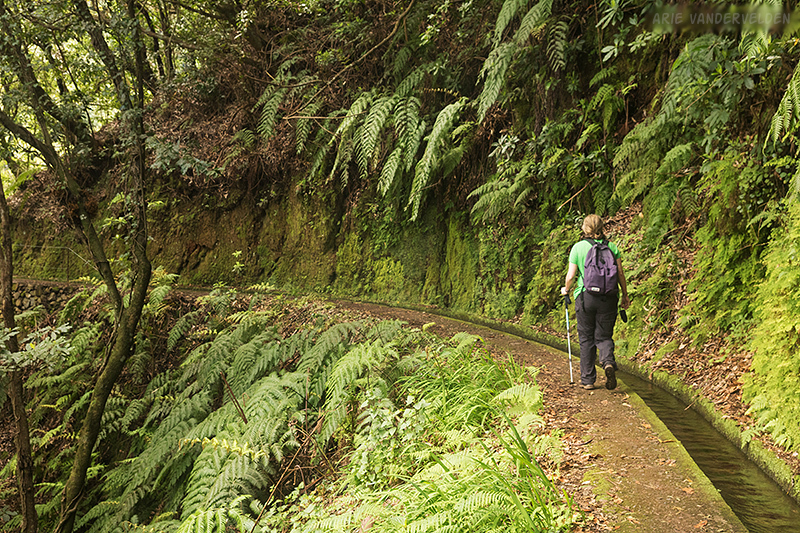 Alongside the levadas are pathways for maintenance, and these pathways are great for hiking. During our visit the weather was atrocious. It was very windy, and rain was pelting down hard at times. Hiking the high ridges was out of the question. But, by driving around the island we were able to find spots where we were in the lee of the weather, and we found a few spots to go hiking. 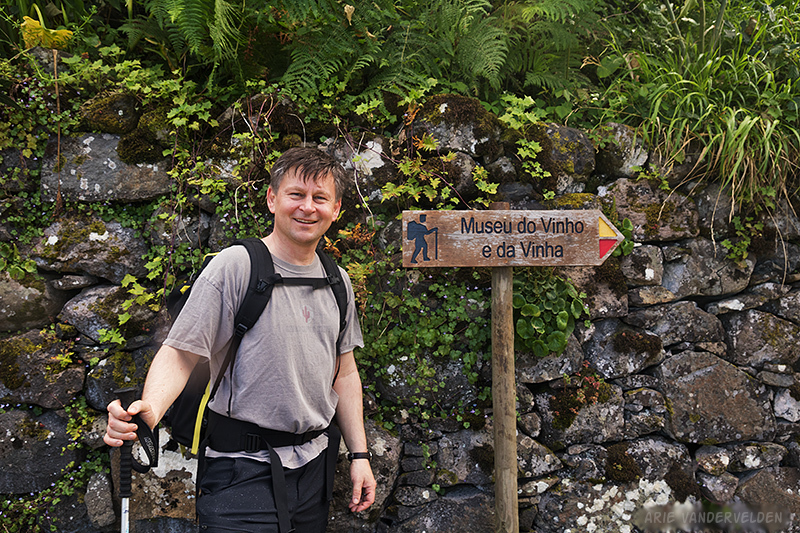 This short and steep trail starts in Arco de São Jorge, across the street from Quinta do Arco. 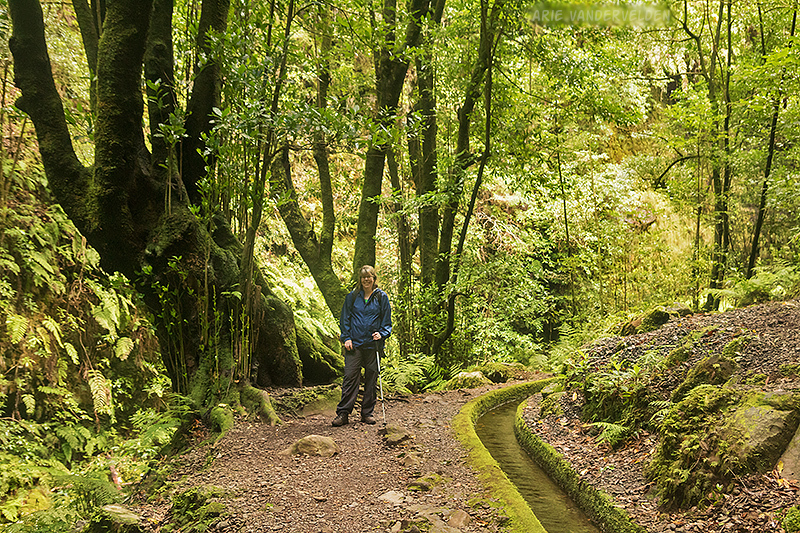 The trail led behind some houses, where it met up with the levada. 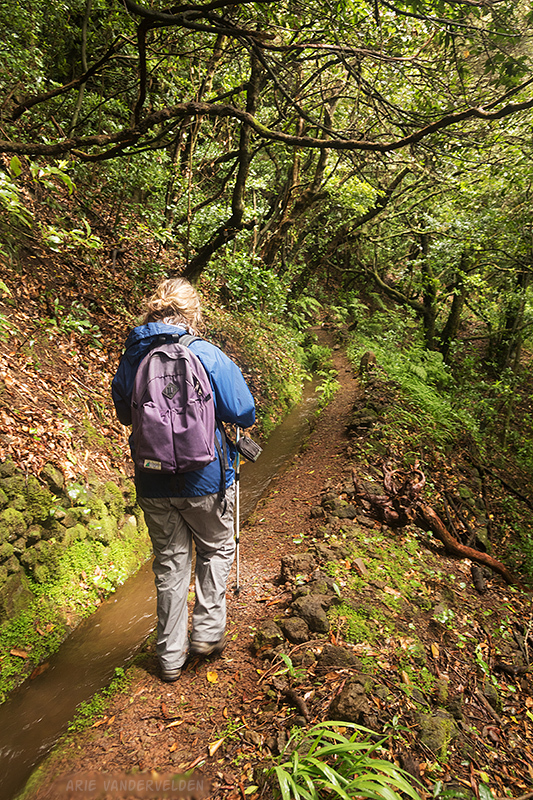 After a short distance the trail diverged from the levada and went up some steep switchbacks to reach a paved road. At the top of the switchbacks. We walked along the road for a while to where it reached a high point, on the crest of a ridge, where there was a viewpoint overlooking the coast. We stopped for some tea. Tea time at our high point. The view down the coast gives a good impression of Madeira. 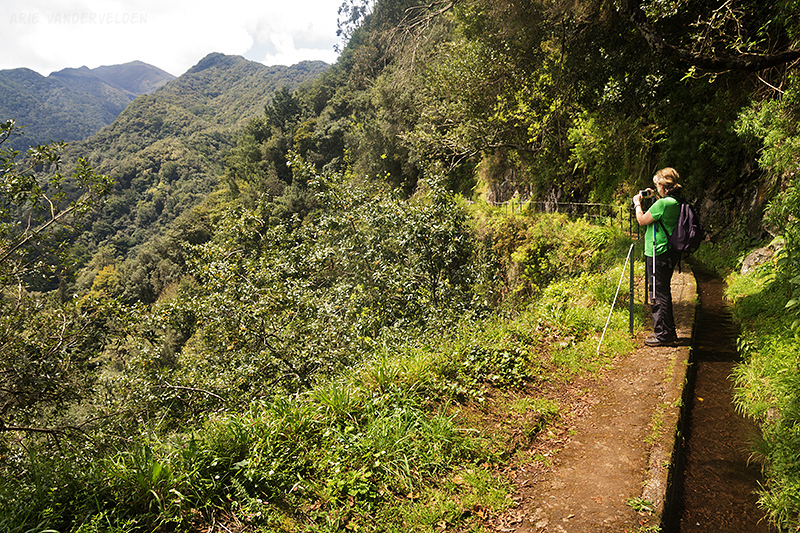 There are steep coastal cliffs, and lush terraced agricultural areas. Looking down the coast you can see that Madeira isn’t exactly a good place for a beach vacation. This is because there are very few beaches. We hiked back the way we came. Water pouring down a hillside. 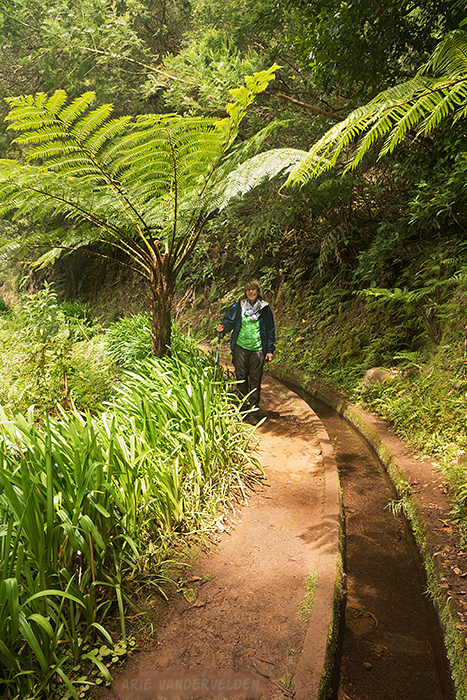 We followed the levada back to the car. … but we almost got diverted to another place. Which way to the museum of wine? The day started out rainy, and we had a slow start. 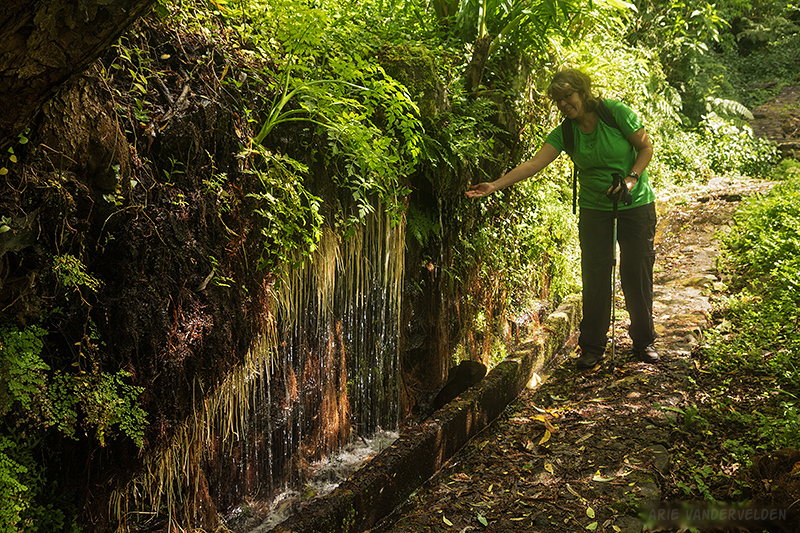 This time we found dry weather near the trailhead of Levada do Mohino, the levada of the watermill. The trail started out in a humid forest. It crossed several side streams. 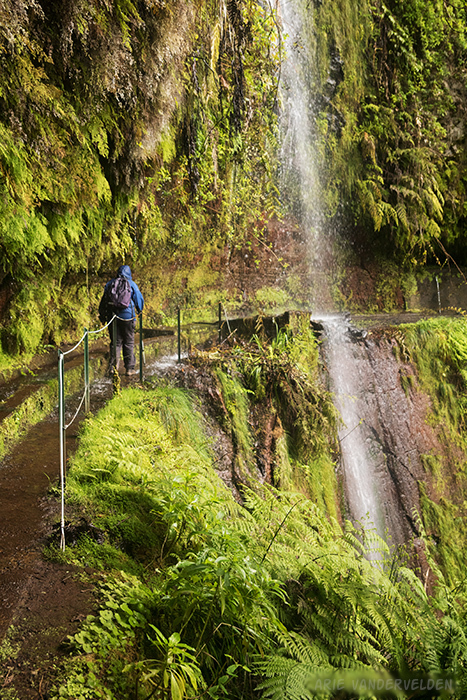 We were glad we had our waterproof boots with us on this trip. Crossing a sidestream on a cliff face. The forest got progressively drier, eventually changing to a forest of eucalyptus and laurel. The terrain got less steep as well. It then entered an agricultural area with houses scattered about. We turned around and went back the way we came. Another rainy day, another slow start, and once again we found better conditions on the north side of the island. 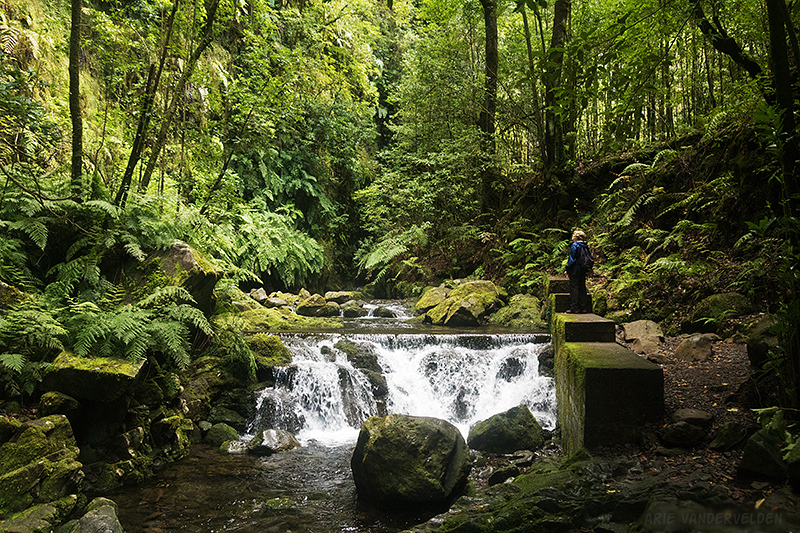 This time we hiked Levada do Rei, the levada of the king. Tree ferns along the path. Hiking beside these levadas is a joy. There is the sound of the flowing water, and as you walk along you keep wanting to see what’s around the next bend. 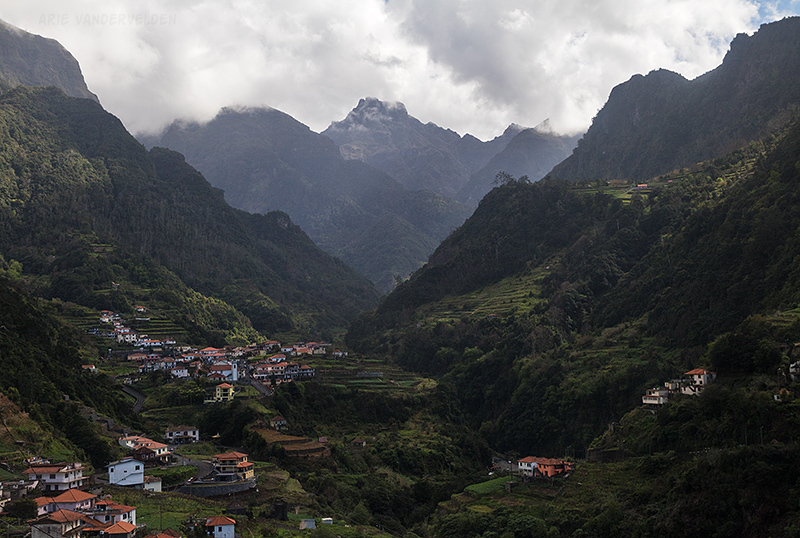 The levadas follow contours around the mountainsides. Past the sidestream, the hillside got steeper again. 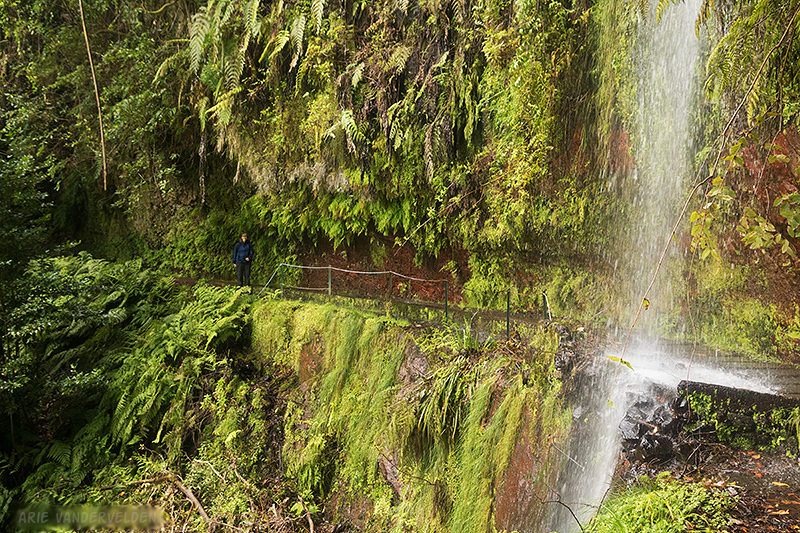 At one point the levada hugged a cliff face. 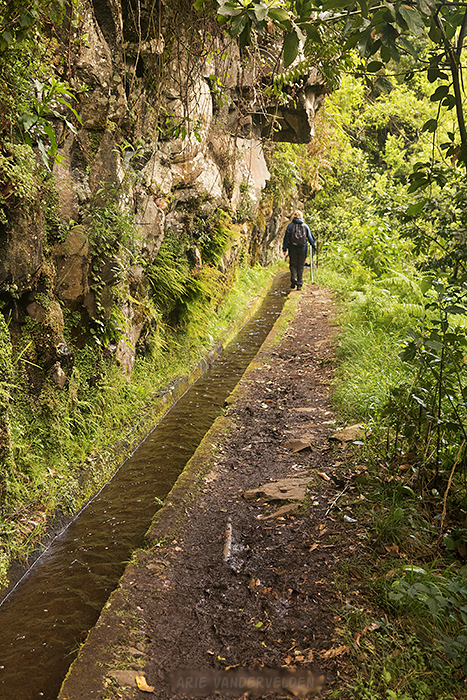 We followed the levada through a short tunnel. Fortunately there were some boards across the water to step on. Steep section. Behind Diana is a short tunnel. The greenery hides the tremendous dropoff to the right. 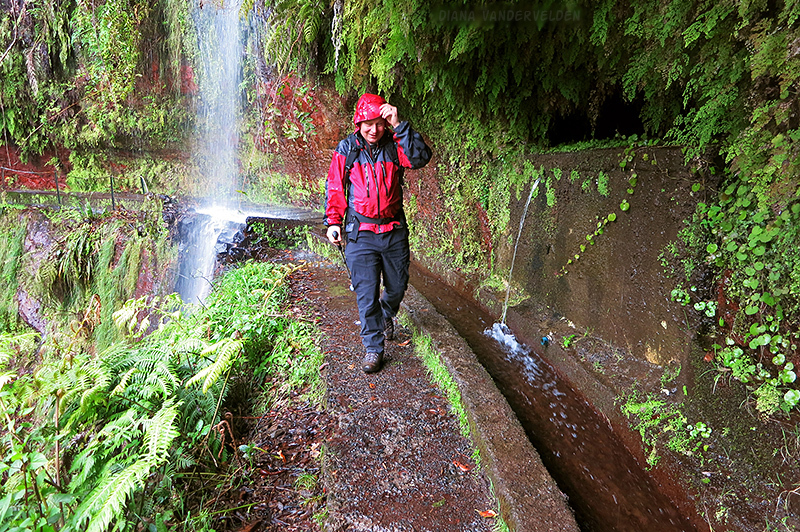 Ahead, a waterfall poured across the levada. 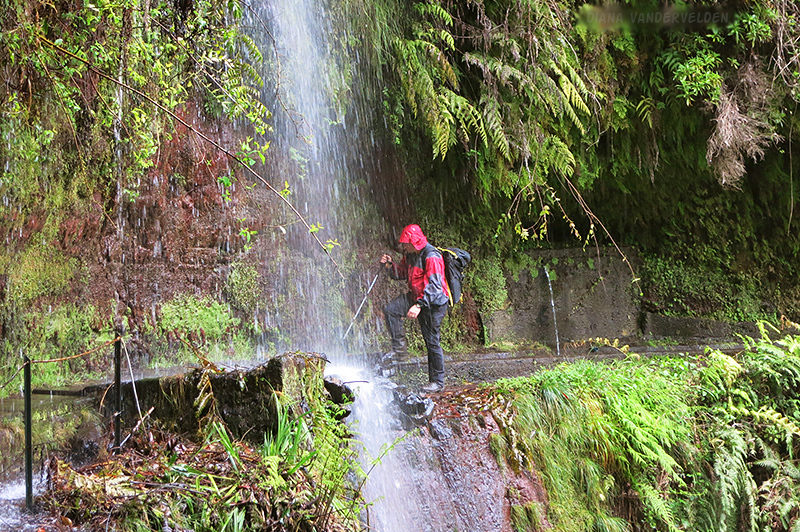 There was a lot of water coming down, given the recent rain. We zipped up the rainjackets, put on the hoods, and went through. Trying not to look at the terrific drop beside me. We were wet from the rain anyways, so what’s another bit of water? Past the waterfall the valley walls closed in, the light in the forest got dimmer and dimmer. 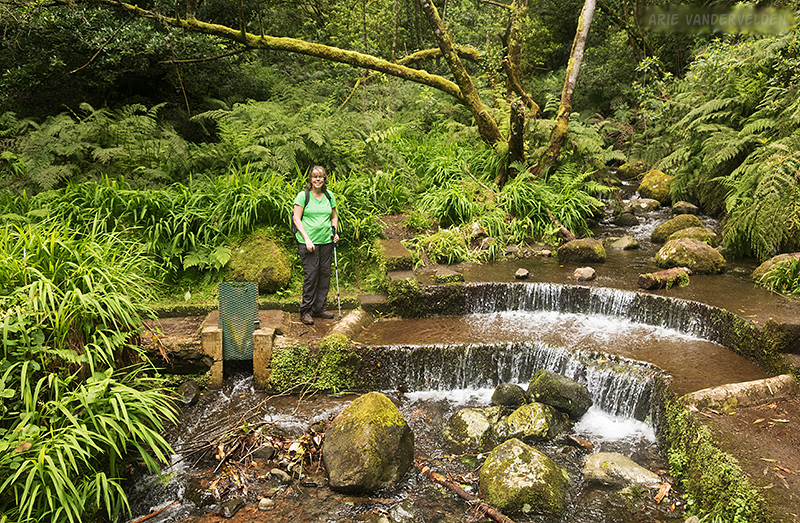 In the forest, Levada do Rei. 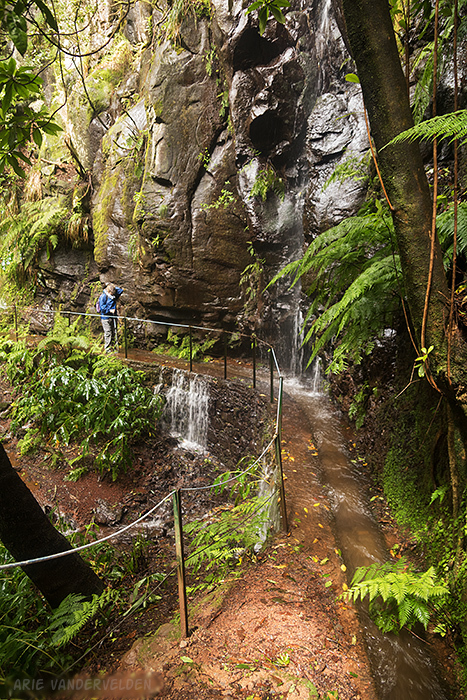 The trail ended in a canyon at Ribeiro Bonito. 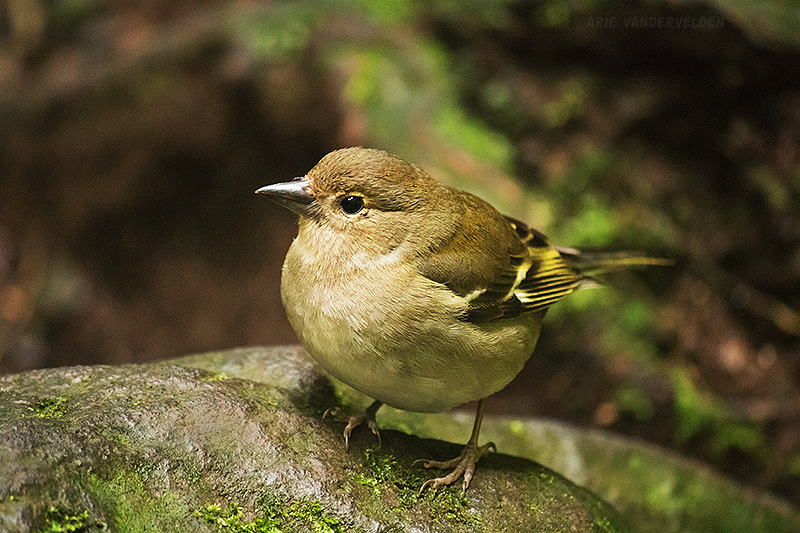 A little chaffinch stopped by, looking for crumbs. We hiked back the way we came. This meant going through the waterfall again and crouching though the tunnel once more. Following the water back down. A look back at Madeira’s rugged interior. 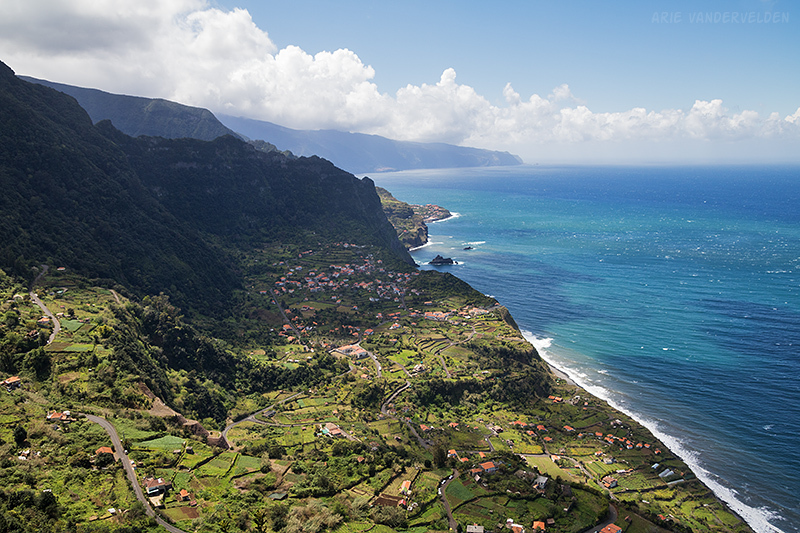 Madeira is served by discount airlines from a variety of European destinations. We caught a Transavia flight from Amsterdam Schiphol for 59 Euro each. Not bad for a four-hour flight. 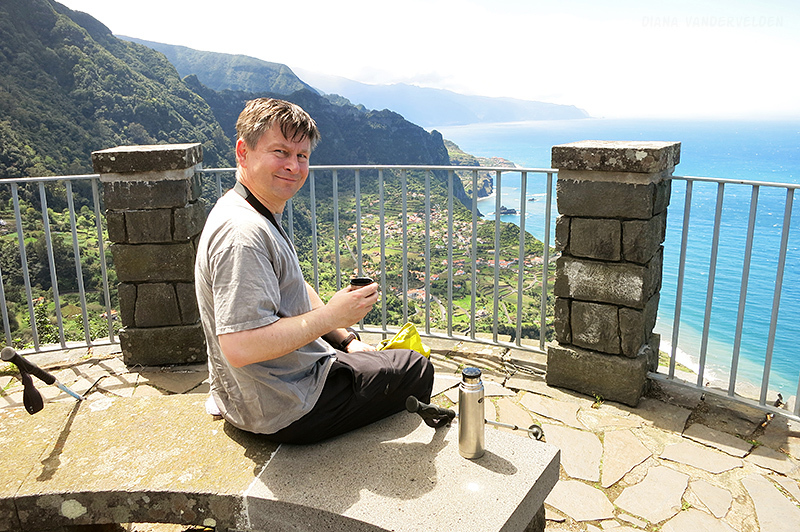 To get around Madeira you need a car. Car rentals are relatively inexpensive. You can book a car on the major online booking sites. 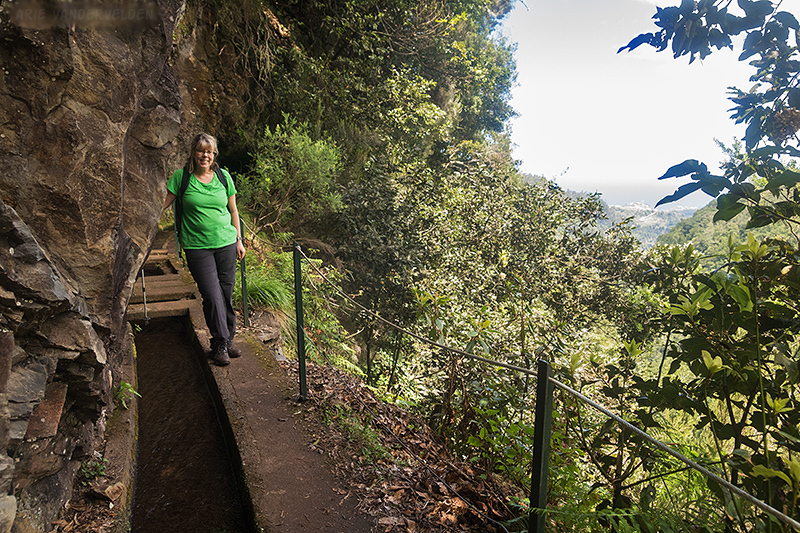 Madeira has a system of tunnels that will deposit you just about anywhere on the island within a short timeframe. I suspect some subsidies from Brussels were involved in their construction. Elsewhere there are narrow, winding roads. Just take it easy and you’ll be fine. I drove though downtown Funchal and it was pretty straightforward. 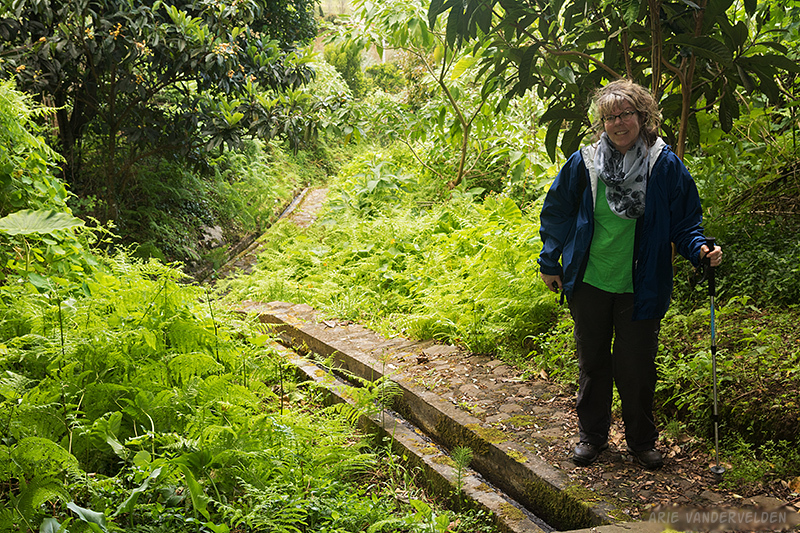 Some of Madeira’s residential roads are insanely steep, and you’ll need to use first gear to climb them. Don’t stall, or else you’ll burn out your clutch trying to get going again. For accommodation I suggest renting a casita (apartment) and using it as a base for daytrips. 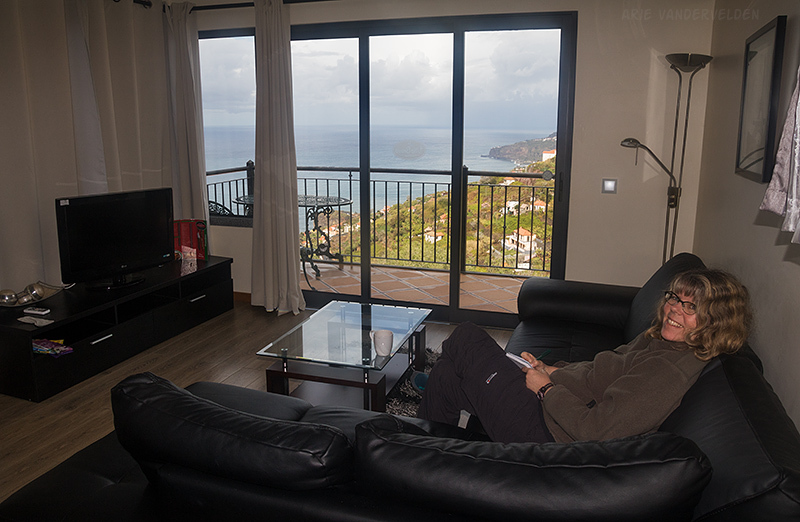 Getting a place with an ocean view is easy because much of Madeira consists of steep slopes looking out to sea. We stayed at Vila Brava, in a village called Ribeira Brava. View from the balcony at blue hour. 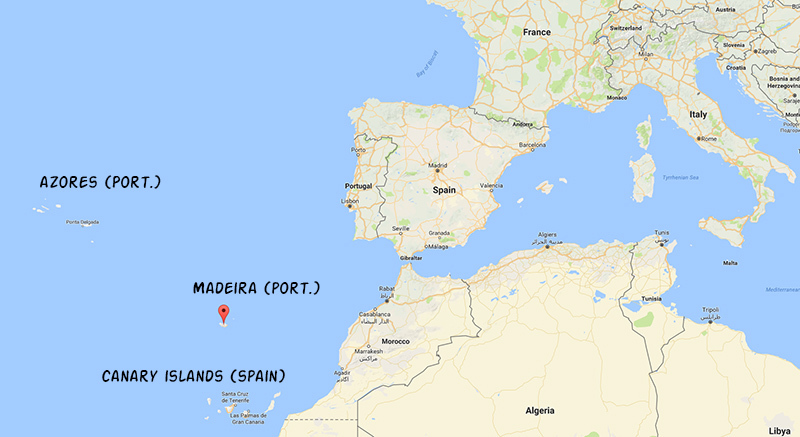 Madeira is Portuguese-speaking. There is a lot of English spoken as well. The food is also Portuguese inspired, with a few local dishes added in. Be sure to try Espada, which is fried back scabbardfish with fried bananas. It’s very yummy. And, of course, Madeira is the source of the eponymous fortified wine.